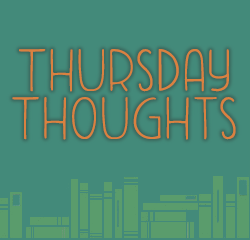 Thursday Thoughts is an original, weekly meme hosted by Ok, Let’s Read where I’ll post my thoughts on whatever topic is thrown at me. If you would also like to participate, find out the rules by clicking here. Because I go to both school and work, personal time for writing and reading is fleeting. Though I normally can only read right before going to bed, I carry a book with me in the hope that time will present itself, putting me reading on the bus route, in the bathroom, in between classes, while waiting for meals to cook, and this is all dependent on my current homework load. I can’t read while conversations are going on. I always find myself unconsciously tuning in to what’s being said – literally eavesdropping – and forgetting about the book in my hands. Either I have to have silence (not including commonplace noises like a clock ticking, a shower running, or a train scraping by), or I have to simultaneously listen to music. I know it doesn’t make sense. Music equals lyrics which in turn equals talking. How is that any different than an overheard conversation? My answer is that I just don’t know. For some reason, the music becomes apart of the background like the pattering of rain, soft enough to not be disruptive but loud enough to drown out all other sounds. When life for me was much more slow-paced, I enjoyed finding time in the late evening to lie down in the backyard on either the hammock or trampoline. I’d be curled up in a blanket or two, the sun about an hour from setting. In that moment, there truly was nothing but me and the words I was reading (or writing). What are your typical reading conditions? Leave a comment below. I just graduated, so I totally understand the having to read where you can thing. I packed books and read in the student center and desperately tried to find corners with no people so I could read.